But first let's define the goal. Eat the lowest number of calories per day. Provide the body with all the nutrients that it needs. Because the secret for optimal health is losing weight, maintaining low glucose level while providing the body with everything that it needs. If you try to use weight using the conventional stupid diets (weight watchers, atkins, etc) then at that low calorie intake your body won't get all the nutrients that it needs and it shall bug you with hunger will you surrender and regain all your weight back. Which data base am I using? There are several dietary programs in the market but I prefer to work with the data directly, I prefer to feel it, to touch it without the GUI of those programs, I would like to do things that are impossible with those programs. I am going to use the USDA SR-21 data base directly. You can download the zipped excel file from the following page. This data base is an excel that contains information about any food that you can think about, cooked, not cooked, frozen, with salt, without salt, etc, etc. For each food it provides the number of calories, sugar, proteins, vitamin this, vitamin that and a long list of maybe 40 elements. Now on a second sheet in the same excel I organized all of my intake for one single day. So you can see that I take two tbsp of almonds milk (using a blender) in the morning which adds 172.5 calories, 6.37 grams of protein to my diet. 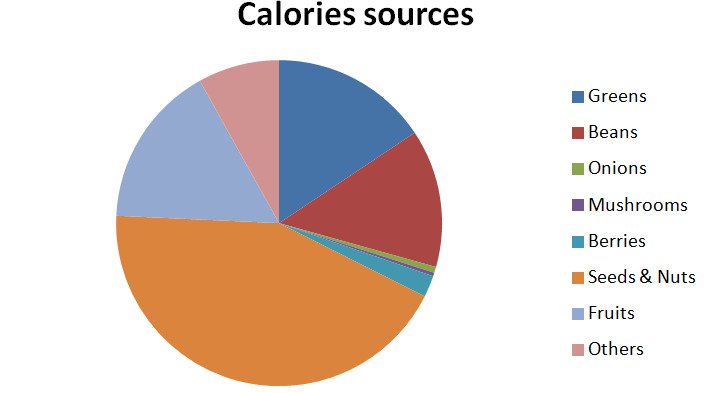 Summing up the numbers give us the number of calories: 1857. As you can see we get most of our calories from nuts & seeds. So you can see the importance of nuts, seeds and beans in this business. 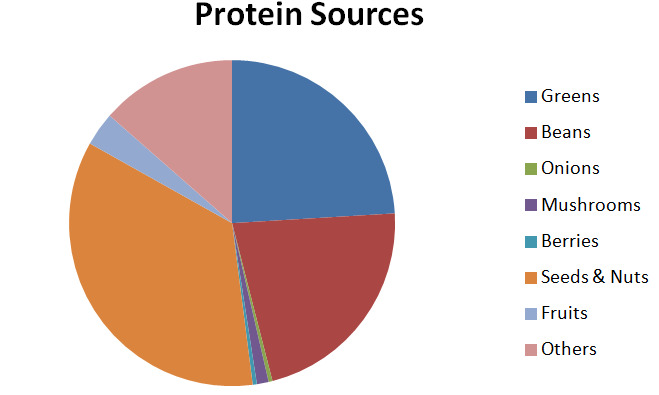 How can we get as many proteins as possible but without 'spending' lots of calories? That's a very easy question for the excel. We create an additional colum that contains the proteins divided by calories, sort everything according to that column and look at the winners - those that have the highest grams of protein per calorie. So the winner is soy which requires 3.6 calories per gram of protein - that's very cheap. It is followed by all sorts of animals living in the cold sea, and also egg whites. This is followed by "normal animals", and followed by cheese. Water crest - 4.78 calories per 1 gram of protein. Down below you can find the nuts & seeds at 30-40 calories per gram of protein. This looks like a waste of calories - this is not the reason why we include nuts & beans in the nutritarian diet. The reason for including them is that the body needs fat and instead of consuming olive oil or canola oil (empty calories), we prefer to consume it from the nuts & seeds where we can still get some nutrients apart from other benefits. Needless to say that at the end of this list are all sorts of oils, sweets, margarines, puddings, candies, alcoholic beverages, all sorts of salad dressings are that are good for nothing - in short food that have lots of empty calories.